We Christians want so badly to take some credit for our salvation. For all of our talk about being saved by grace, statements like the two above give the impression that we are saved by “grace plus” – grace plus the little bit of help God needed from me. As I prepared the sermon, I wanted to convey the Gospel’s core of grace. The salvation John 3:16 speaks about is not something we earn or deserve, but is totally and completely a gift of God through Jesus. So I included this simple analogy in my sermon. I’ll share it here with two caveats: Like all analogies, it is an imperfect representation of reality. And, I’m sure it’s not original with me; perhaps only the emphasis on grace is a little different . . . Imagine you’re trapped in a burning building. There’s no way out. 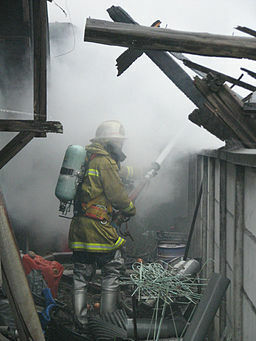 A firefighter breaks through the flaming wall. “Hop on my back and I’ll get you out of here!” So you do. When you tell the story, you’re not going to say, “I decided to save myself from the fire,” or, “I invited myself onto that firefighter’s back.” At least I hope not! You’re going to tell people that the firefighter saved you, that it was the only way out, that the firefighter coming to save you was the only alternative to sure death in the flames.” You are, unless you are an incredible narcissist, going to give the firefighter all the credit for your rescue. And also that the firefighter dies in the act of bringing us out, and that he knew he would but saved you anyway. That was his whole purpose for being there, after all. I'm an unexpected pastor. Why unexpected? Because no one is more surprised than me that I'm a pastor. See the "About" page on my blog for more info. This entry was posted in Christianity and tagged Grace alone, John 3;16, Salvation analogies, Salvation by Grace. Bookmark the permalink. Pastor Dave, I get the argument and agree… but… if God was ‘all-loving’ and “all powerful”, why doesn’t he just save everyone from the fire…? Tim, maybe he will . . . But barring universal salvation, which I don’ t believe the Bible teaches (but certainly wouldn’t mind being wrong about), I surely don’t know the answer to that question. Some say it’s because of God’s “justice” (sin must be punished and those not “covered” by Jesus blood are in big trouble), others say its because some are predestined and others are not. There are lots of other theological theories and I trust many doctoral dissertations have been written on the subject. As for me, I struggle to be content with trusting God, with thoughts beyond my thoughts, ways beyond my ways, has good reasons for everything God does, even (especially) those things I don’t like or don’t make sense to me. My “job” is to trust, which I really can’t do – only the Holy Spirit can create that kind of faith. My secondary “job” – not as a pastor but as a Christian – is to tell other folks about that “fireman” who came to save them at the expense of his own life.